​I have to confess that when I awoke the this morning and noticed that dawn was just coming on and that my tarp was moving slightly in the breeze, storm fear took over. I climbed out of my hammock, went over to John and awakening him suggested that we pack up and get out before the storm hit. He calmly grunted something about waiting at least until sun up, and liking his nice warm bag. So I went back to mine. The next time I awoke to bright sunshine, totally clear skies, and dead calm winds! John kindly handed me a cup of coffee and said nothing about my dumb idea at 5:00am! ​Breakfast this morning was PackIt Gourmet’s West Memphis Grits Soufflé with bacon bits added. Now that is a breakfast. I also had another Cliff Bar, coffee and lots of water. ​We had agreed to depart earlier this morning so I am proud to say we were walking out of camp about 8:45 instead of 9:00. We just can’t seem to get going any earlier. The hike to the road was only a couple miles but included some impressively steep climbs and descents and several striking views out over the lake from the hill tops. The trail itself was quite good and easy going and we arrived at the road around 10:00am. The car was two miles east. John wanted to walk back to the car on the escarpment trial so he took my keys and a bottle of water and headed off up a connector trail. Charles and I sat by the bags at a very nice picnic area beside the road which included a very nice enclosed latrine. I laid out my shoes and socks and basked in the sun. Another backpacking trip over – except for the 375 mile drive back home to southeast Wisconsin. 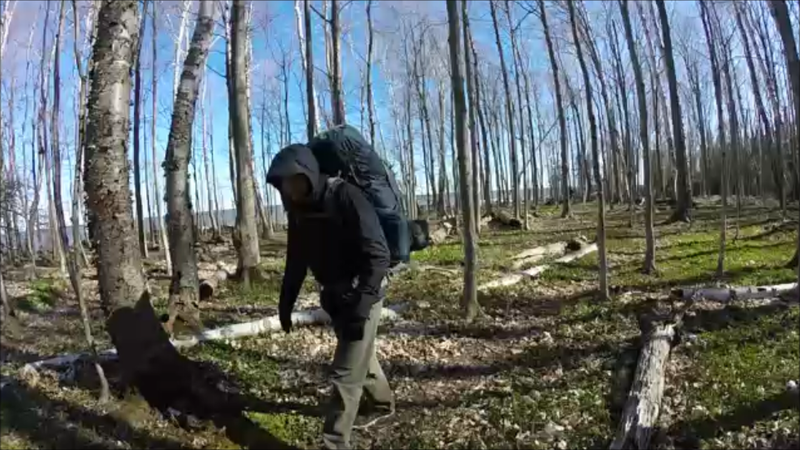 ​On this last day we hiked 3.4 miles, averaged 2.3 mph with a maximum altitude of 1,150ft. and a minimum of 614ft. 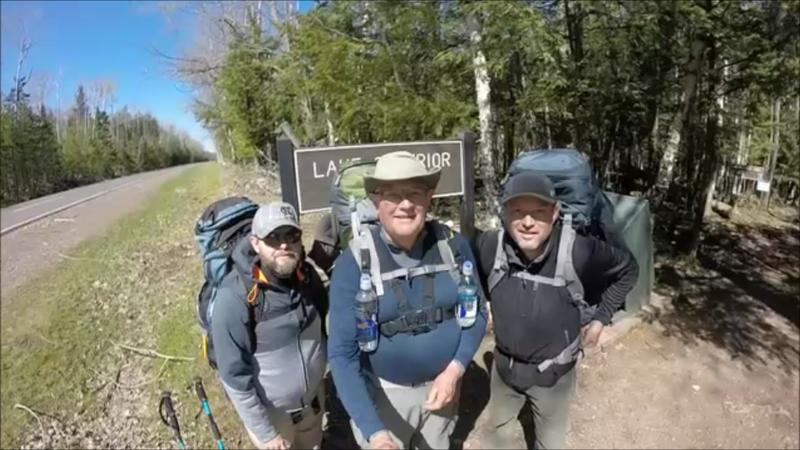 ​For the whole trip, we hiked 24.4 (John added another couple miles going to the car) miles over two full days and two half days, camping three nights, the first and last in hammocks with the middle one on a cabin. ​We had a lot of fun. It was hard work and in that blow down area almost overwhelming. We liked hammock camping with all of us saying that is far more comfortable than sleeping on the ground. We stayed warm every night thanks to good down sleeping bags, rather inexpensive 35ish degree under quilts lined with Costco Down Throw quilts and tarps. The lowest temperature that we have documented was 27 degrees on that last night according to the ranger at the headquarters when we checked out. Daytimes were probably in the upper 50s and lower 60s, excellent for hiking. Our clothing and gear served us well. The only “complaint” I have is that my Merrell hiking boots are heavy. John and Charles both had low top running shoes. Yes they got wet feet, but I got one wet foot and my boot didn’t get dry until today, three days later! I love the footing the boots provide. I just dislike slinging a pound and a half every time I move my foot. ​As always, we had half again as much food as we needed. Next time I think we’ll take one single person package of each main course for each meal plus a grab bag of just a few extras just in case. I had two packages for each meal. Except for the last night, we just didn’t want that extra one. Everyone loved the salsa appetizer so having some of those light weight, tasty items available to choose from would also be a way to add enjoyment and quantity if needed without as much weight. ​For water I carried three 700ml smartwater bottles and left camp each morning with those full. I like their size and the simple flip tops. I also had some little clips that made it easy to attach one to each backpack front strap which moved some of the overall weight to the front rather than adding to the back. I believe we only filtered water along the way twice. It was quite cool so in warmer weather one would need to do it more often. We were fortunate to be near filterable water every day except the first one. The Escarpment trail had few water sources. End of trip. What wonderful experience for this dad with his two sons! I hope we do more like it.